CNC machining or routing is the cutting, shaping, drilling, milling, and surfacing of materials using a computer controlled router or milling machine. Plastic can be cut, shaped, moulded with patterned router cutters, drilled, surfaced, contoured etc. Greyco Products High Speed Multi-Spindle Routers to produce the highest quality parts, maintaining tight tolerances for prototype to production runs in many materials, producing your parts on time and cost effectively. CNC routers ensure high-speed automated routing in all types of plastics. Our CNC routing operations aid in producing complex shapes and designs with good dimensional stability. 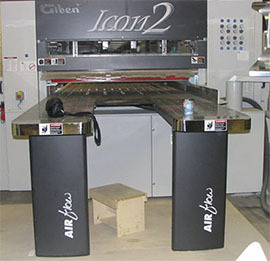 2D as well as 3D cutting can be quickly set-up and programmed in our CNC routers. A 8 position automatic tool changer option in each router ensures concurrent, multiple routing operations. Plastics with thicknesses ranging from 0.060. to 6. can be handled in our CNC routers. Customer designs are accepted in DXF or CAD file formats. We also finish machined parts through sanding and polishing. CAD software such as Alphacam and Solidworks is the language that the CNC router understands, and by which it is able to translate your concept into a beautiful finished product. We can use your own Solidworks files, or create them for you from just a rough paper sketch.
. CNC Router Tolerance 0.05. to 0.04.
. Typical Sheet Gauges 0.060. up to 6. The applications for this type of high tech digital rendering equipment are seemingly endless. Some examples are domes, hemispheres, cylinders, cones, point of purchase displays, machine guards, shadow boxes, acrylic furniture, lighting panels, prototypes, trays, boxes, museum cases, windshields, aquariums pedestals and acrylic art. industrial manufacture and transportation are just a few examples. We work with virtually every type of plastic. Examples of materials that we machine with are acrylic, poly- carbonate, PETG, ABS, Styrene, PVC, HDPE, UHMW and DELRIN. There is really no what is possible. To summarize the benefits of CNC machining, it is possible to cut complex shapes and designs that are impossible to create using analog machinery. CNC machines have the capacity to cut hundreds or even thousands of parts quickly – all exactly the same, and withing amazing tolerances. The parts that are produced have excellent dimension stability, and both the set up and programming are fast. Another one of our favorite CNC machines is the panel saw. This hi tech beauty is fully computerized, and is the paradigm of efficient cutting. The saw kers are remarkable low, and it can handle sheets up to 5″ x 5′ x 10′. Greyco Products CNC Routing machines are all able to produce almost any cut shape from an extensive range of industrial plastics which are available in today’s market. When we load your CAD files onto a PC we are halfway to having the program written for our routers. E-mailing or sending CAD files enable us to machine direct from your work files, saving time and money. CNC Machining is the process of fabricating customized parts using a CNC router. c & c machine, c and c machine, cnc milling, plastic parts, cnc software, Ontario, Canada.